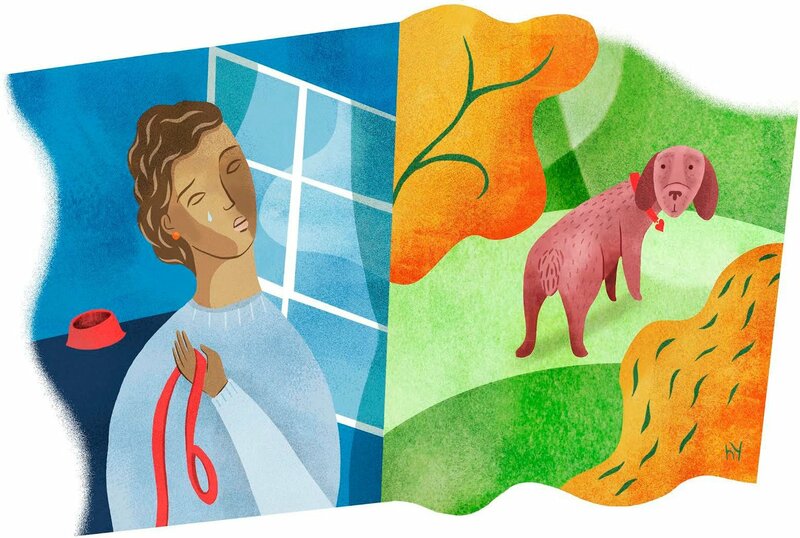 I recently read a wonderful story in the New York Times “Things I Wish I had Known when my Dog Died” called What Emily’s Death Taught Me by Jen A. Miller. It talks about what a person experiences and learns from the death of a beloved pet. In this case, the author is a freelance writer who works at home and is single, so her pet dog Emily was perhaps even more of a beloved companion. – Most people will say the wrong thing. They are trying to be sympathetic but often get the words wrong. Or they don’t understand that losing a pet can be as bad as losing a person. -You may feel overwhelmed by guilt, both from believing you could have done more and from feeling a sense of relief that your caretaking duties are over and the pet is no longer suffering. -You feel “unmoored” – as if the structure of your life has shifted drastically because the caretaking that was a natural part of having a pet becomes so much a part of your life and your daily routines. -You are exhausted by your own grief, and as a result, put off doing things you should or planned to do. -The grief ebbs and flows, coming back at predictable and unpredictable times, each time feeling raw and new. -It will get better…you don’t want to hear that and don’t even believe it…but over time the pain does diminish. It may always leave a hole in your heart, but you don’t pay as much attention to the hole as other things fill your life. I so appreciated this article and reflected on how I felt just such things after the death of Einstein, one of our beloved parrots who died at the age of 32, and of Siggy who we had to put down at age 20 because of illness. More importantly, I thought about how grief is grief. Whether for a beloved pet or for a person we love dearly. I remembered some of the same things happened after the death of my mother and realized that loss and grief teach us things whether we want to learn them or not.